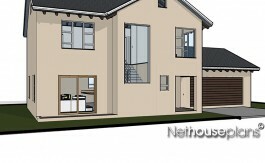 251m2 double storey house plan with 3 Bedrooms, 2.5 Bathrooms, Double Garage, Lounge, Dining & Patio. A 251m2 Bali style architectural design with two levels. The integrated garage can fit in two cars and still has more than enough space for extra storage. The driveway provides extra parking space. The internal access in the garage leads to the kitchen. This feature is great specially during rainy days, you can easily get from your car and into the house without getting wet. The kitchen is fitted with a wide counter which has more than enough space where you can prepare and cook your meal. A double sink is usually installed for dish washing purposes. The breakfast counter provides a convenient space where you can meet and chat in the morning while having that nutritious breakfast. The kitchen flows through to the dining area and family room.The dining area, being close to the kitchen makes it easy for you to serve your food. The family room is spacious. This is a great place where you can spend some quality time with the family. The fireplace in this area provides the warmth necessary during those cold days. The lounge area is also very spacious and being close to the entry hall, is located perfectly for welcoming visitors. The design of the lounge area provides a private feel to the room. A guest water closet is appropriately nearby when needed. Completing this floor is the patio outside which can be accessed through a sliding door either from the lounge area or from the family room. Because of the ease of access, it provides extra space when accommodating a lot of guests. The patio is great place to have a barbecue or a place to read a book and relax. A staircase near the entry hall leads to the bedrooms upstairs. 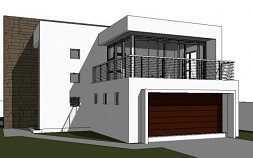 As you reach the top of this double storey house plan online, a lobby can be found. A place to relax or study. Two well-appointed bedrooms share a common bathroom. Aside from being your kids bedrooms, they can also be used as a guest bedroom or an office. The master bedroom is spacious, you can add a couple of furniture to create a small lounge area inside. The master bedroom is completed by its own bathroom. A balcony can also be found on this floor and can be accessed from one of the bedrooms or from the master bedroom. A great place to enjoy the view. A perfect double storey house plan online for a perfect family!